Go2marK is a result oriented Social Media Management company based in Las Vegas. With all the complexities in place you need a social media management company to strategize, to set up, to manage and to optimize and maintain your social media optimization and social media advertising efforts. Before taking on your social media management project we determine what your SMO goals are. Do you want to reach a wider audience on social media such as Facebook, YouTube or Twitter? Boost posts to reach a wider audience? 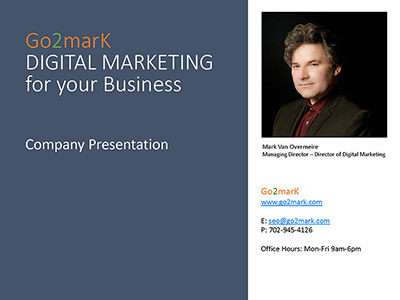 Go2marK ensures that your social media advertising goals can be reached.